TALLAHASSEE, Fla. (AP) — Floridians will choose between one of President Donald Trump’s most vocal supporters and an unabashed liberal when they elect a new governor Tuesday. The contrast couldn’t be greater between Republican former U.S. Rep. Ron DeSantis and Democratic Tallahassee Mayor Andrew Gillum, who would be Florida’s first black governor and the first Democrat elected to the office since 1994. Toni Pentecouteau, a 72-year-old retiree from Destin, is supporting Gillum and cites, in part, DeSantis’ close relationship with Trump. “I’m proud to say that of the candidates running for governor, I’m the only one that has worn the uniform and served in our military, I’m the only candidate that ain’t going to raise your taxes here in Florida and I’m the only guy who can credibly say that I’m not under investigation for corruption by the FBI,” DeSantis said to cheers. Gillum has said he’s not a target of the investigation. Racial division has also been an issue in the campaign. The day after the primary, DeSantis said on Fox News that Florida voters shouldn’t “monkey this up” by electing Gillum. DeSantis spent weeks explaining the remark, saying it had nothing to do with race, but rather his belief that Gillum will hurt Florida’s economy. Gillum is taking a nontraditional route in the general election. He’s seeking out young voters and minorities who tend to have lower turnout in a midterm election. He’s also going to areas Democrats have traditionally ignored, like Okaloosa County in the western Panhandle, which Republican Gov. Rick Scott carried in 2014 with more than 75 percent of the vote in a year he didn’t receive 50 percent of the statewide vote. Trump carried the county with 71 percent of the vote in 2016. If DeSantis wins, he can give Trump credit for exciting the party’s base. 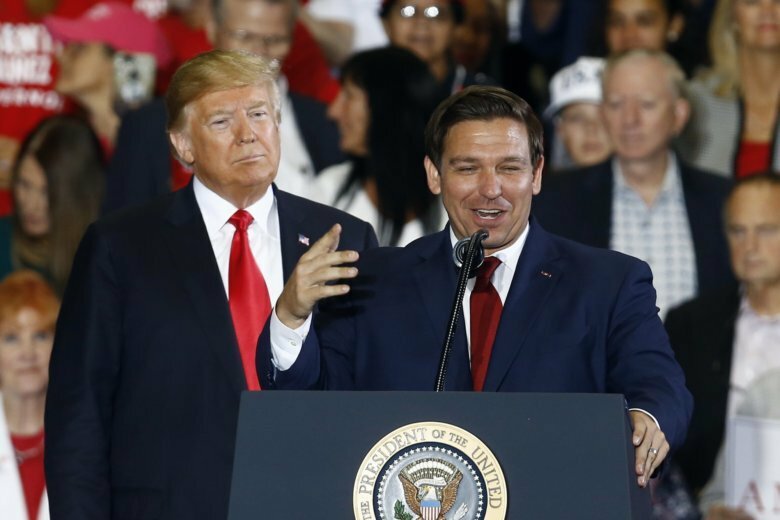 When DeSantis wrapped up his speech at Wednesday’s Trump rally, he turned to the president and shook his hand.